What are the parts of a turtle's shell called? Today’s Wonder of the Day was inspired by Taryn. Taryn Wonders, “How does a turtle's shell stay on if they are in a really fast current?” Thanks for WONDERing with us, Taryn! Have you ever been told to come out of your shell? People sometimes use this phrase to refer to kids who are shy. If you're shy, sometimes you keep to yourself and don't interact much with others. Keeping to yourself is kind of like a turtle hiding inside its shell. Turtles feel safe inside their shells. Likewise, you might feel safe from the outside world when you keep your thoughts and feelings to yourself. However, we believe most turtles would tell you — if they could talk — that you need to come out of your shell every once in a while. When you do, you encounter the world and meet new friends that make life more enjoyable. Let's take a closer look at the turtle to see what the world is like for them when they peek out of their shells. Turtles are reptiles that are known for the hard shell on their backs. The shell acts as a shield that helps turtles defend themselves from predators. When threatened, turtles will retreat into their shell for protection. Turtles have been around for over 200 million years. This makes them one of the oldest reptile groups on Earth. Unfortunately, some species of turtles today are endangered. Turtles can live on land or in water. Some of the largest turtles in the world are aquatic. For example, the largest turtle — the leatherback sea turtle — lives in water. It can grow to almost 7 feet long and weigh over 2,000 pounds! The largest turtle in North America is the alligator snapping turtle. It can grow to almost three feet long and weigh as much as 250 pounds. That's big, but it's a far cry from the size of the leatherback sea turtle! Did you know that the parts of a turtle's shell have different names? The upper shell is called the carapace. The lower shell that covers the belly is called the plastron. The two pieces are joined together by pieces of bone called bridges. Part of the inner layer of a turtle's shell consists of bones that are part of the turtle's backbone and ribs. That means the shell is an integrated part of the turtle's body. If a turtle wanted to leave its shell, it couldn't! If you’re coming to Wonderopolis tomorrow, you might want to pack a lunch! Role play with your friends and parents. If you get nervous in certain situations, such as when you're at the doctor's office or in a store, you can pretend you're in those situations with your friends and family. Pretending can help you feel less nervous in those situations in the future. Learn good body language. Practice making eye contact and smiling warmly. These simple things can help you feel more at ease in social situations. Know how to start a conversation. A few simple phrases can make it easier to strike up a conversation with another child or a teacher. Try it out! You might be surprised what a simple, “Hi! How are you?" can do for you. Invite a friend over to play. It can be easier for kids to develop friendships when they're in a comfortable environment, such as their homes. Having friends come over to play can be a great start to what could be a lifelong friendship! They are! And then, baby turtles grow into BIG turtles who are still cute! I have 3 baby turtles at home the love to play around. We're glad you like it, Nicole! What's your favorite topic? We're sorry you feel that way, trinity. We're sorry you feel our sense of humor missed the mark on this title. your wrong gary also thats my middle name. We're sorry you didn't find our title amusing. omg!! i love all animals! loved seeing the pic of the turtle.....please respond. We're glad you enjoyed this Wonder, cole. Make sure you ask an adult, billy! We're glad you liked them, sloth! Ah! That does sound scary, Turtle Expert! Thanks for sharing, Turtle! We hope that you check out our other Wonders about turtles! My little sister is shy but once she gets to know you she will talk to you.And I like turtles!!!!! I'm glad that turtles have their shell to protect themselves. Also I never thought about how turtles can't leave their shell. That was a great wonder. My turtle got killed by a fox and it came out of its shell. My research project is about TURTLES! Is it true that Jusus Rivas did the first experiment on an anaconda? That's it from me PHOENIX! Can you do a wonder about shoes? Never they're born with it. Cool! I love turtles! Great wonder!! Thanks! =Bryleigh= :) :D :( :P ;) P.S. I have tried origami, but it didn't turn out the way I wanted it to. :P Oh well! Wow yesterday I guessed today's wonder right! I love turtles some of them are so cute! I never knew about the turtle shell parts. I will know that now. I think tomorrow's wonder will be about cafeteria foods or some restaurant. awhat it's like to be shy. Not Quite! bthe leatherback sea turtle. Not Quite! ctypes of turtles and why they have shells. Correct! dthe parts of a turtle shell. Not Quite! 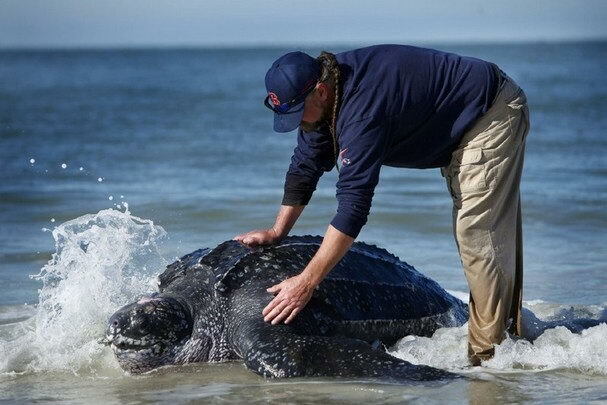 The leatherback sea turtle can weigh over ______________ pounds! What type of animal are turtles?